Visit Forbrukslan to compare loan offers and to get the best possible interest rates. Sign up at Norges Casino and claim 100 registration free spins! Players from the United Kingdom should visit https://www.new-casinosites.co.uk if they want complete coverage of the latest released casinos. Are you interested in Fantasy themed slots? Play with excitement at a mobile casino that features the latest games like Warlords and Double Dragons, LeoVegas. If you're located in Norway and interested in exciting games, you should visit CasinoPåNett.org - an online casino review site. For the best casinos and top bonuses in Sweden, visit https://www.casinobonusar.nu. Latest and newest games and casinos of all genres, including fantasy-inspired, visit https://www.nyacasinon.com. Gamblers from the UK can find the latest no deposit casino bonuses right here! If you're in Sweden and looking for top online casinos, check casinofeber.se for helpful reviews! Play fantasy related slots at the free online casino Spelautomater.se! A new lore update for INSOMNIA: The Ark looks at the man behind the House of Bea Kera. Hello everyone! Previously, we have covered some of the factions that you get to meet on Object 6, and today we are continuing our INSOMNIA: The Ark lore series with a fresh installment. Since the House of Bea Kera is one of the largest groups in Reservation D-106 and the entire sector D, it's time to give some extra attention to their leader. Being an eccentric and charismatic personality, Opherod had a big impact on the religious perception of ghetters, the descendants of illegal inhabitants of the space station. He was born in the Junkyard and had to live through many hardships with wit and resourcefulness as his only weapons. After moving to Reservation, Opherod mostly engaged in petty criminal activities and worked on improving his own education. He also managed to become a family man: his wife gave birth to two boys - Darat and Kololei. At the age of six, Darat became a victim of a severe form of somnia which also granted him strange abilities. Due to the fears surrounding somnia, Opherod was forced to do everything possible to hide his condition and find a cure. A few years later Opherod met Scuffler, a deformed psychonaut who was known as a talented chemist. He invented "wax" - a psychedelic crioma based drug that was able to increase the somnic level of the consumer. After his first experience with it, Opherod realized that this might be the way to study somnia closer and to bring Darat to normal life. He started studying "Taboro" - a guidebook to somnia's world written by a long time deceased nameless author who tried to describe his somnia fueled visions. This brought him to the idea of building an underground "wax" manufacturing facility. He started developing a syncretic religious concept and attracting followers that served as test subjects: this is how the House of Bea Kera was born. 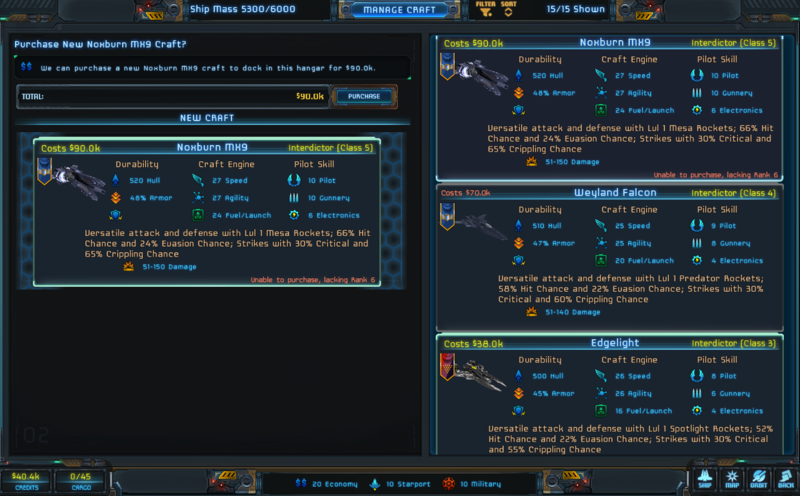 With Update #141, we've introduced a wide variety of different craft visuals for shuttles, interdictors and carriers. 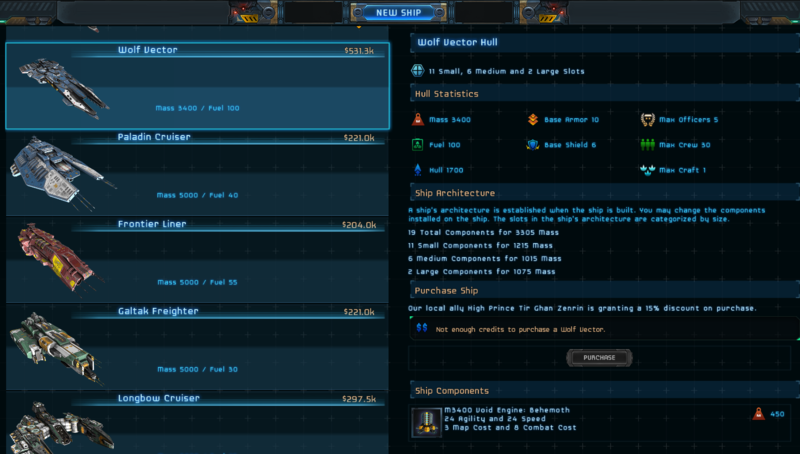 On the component side, we've fixed the missing Armor bonus of Reinforced Hangars. In part 25 of a blog series on Mass Effect: Andromeda Shamus Young has declared BioWare dead. Everything in Andromeda is constructed backwards. Instead of saying, "Here are the events of the past, what sorts of situations and stories would come from that?" the writer says, "I want the player to drive up this hill and shoot all the dudes at the top. What's the simplest possible scenario I could use to justify that?" The player choices are few, arbitrary, poorly depicted, and lacking in interesting options. Dialogs are rare, linear, and lacking in player expression. The few characters you meet in the open world are shallow and bland. The villain is a sophomoric one-note bore. The worlds are, by design, a mostly empty wasteland with no history, culture, or wonder. Exploration of these alien worlds consists of driving around on pre-existing dirt roads so you can gun down clusters of mooks. The developer's perception of what made the source material interesting is so wrongheaded that this project was in trouble before it ever left the dry-erase board. This team was not equipped to tell a space story on this scale. I don't care if you're talking about details-first or drama-first, this is not a storytelling team in any form. This storyteller might do an okay job if you want a linear shooter with fixed cutscenes and no player agency, but they're completely unqualified to design a world to support dozens of hours of exploration, exposition, and player expression. Here's one to add to you Wishlist right away - OCTOPATH TRAVELER is coming to Steam on June 7, 2019. It's possible to start the game with any of these characters, and build your party in any order you wish. Every character has a unique story, combat skills and 'Path Actions' - abilities they use outside of combat. Official Release Date and New Trailer! We're almost there! Just two more weeks and Fell Seal will be coming out of Early Access. On April 30th, you will be able to experience the epic conclusion to your adventure in Teora. It has been quite the journey from our Kickstarter campaign to where we are now, but it was well worth it! We're extremely grateful for all the feedback and suggestions we've gotten from the community and for how much it's helped us make the game better. Once again, a huge thank you to everyone that took the time to check the game out and give us their comments and support. Your help has been truly invaluable! That being said, there's still plenty of balance updates and additions to be made, so it's back to work for us! Some new DLC for Conan Exiles has arrived called 'Treasures of Turan'. Treasures of Turan comes with new building pieces, placeables, armor sets, weapon sets, warpaints and pets. 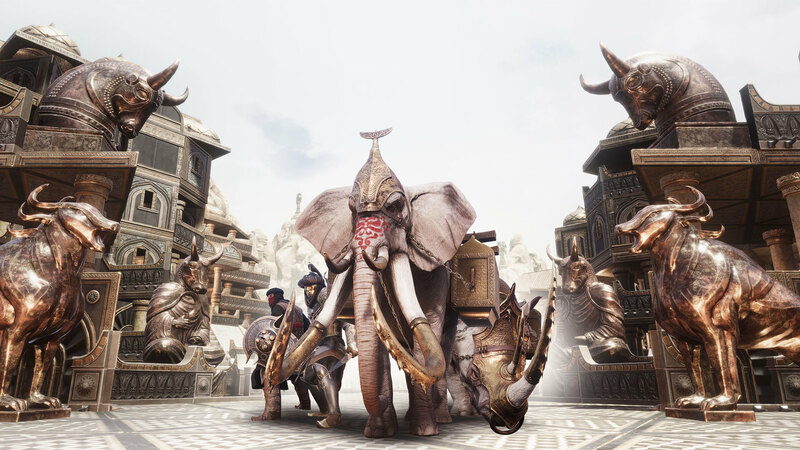 As Turan is one of the wealthiest nations in Hyboria, it's fitting that this offers the most ostentatious gear and building pieces in Conan Exiles yet. Enjoy the golden decorations of the building pieces and finely wrought weapons and armor. TheGG reports that Pillars of Eternity II: Deadfire has been nominated for best adventure game and best writing at the Webby Awards. Baltimore - MD - April 11th 2019 - Independent games publisher Versus Evil and developer Obsidian Entertainment today announced that "Pillars of Eternity II: Deadfire" has been nominated for Best Adventure game and Best Writing categories in the 23rd Annual Webby Awards. Hailed as the "Internet's Highest Honor" by The New York Times, The Webby Awards, presented by the International Academy of Digital Arts and Sciences (IADAS), is the leading international awards organization honoring excellence on the Internet. The Sinking City was previewed by Destructoid. Because the game is still in beta, there were several bugs and unfinished assets I encountered, all of which fell on the more hilarious side of the spectrum. One prominent character had her model used for multiple other characters, the city's hospital had patients with a nasty case of levitating all over the place, and, my personal favorite, two NPCs on the city streets were standing face to face as one repeatedly shot the other one in the stomach with a shotgun. 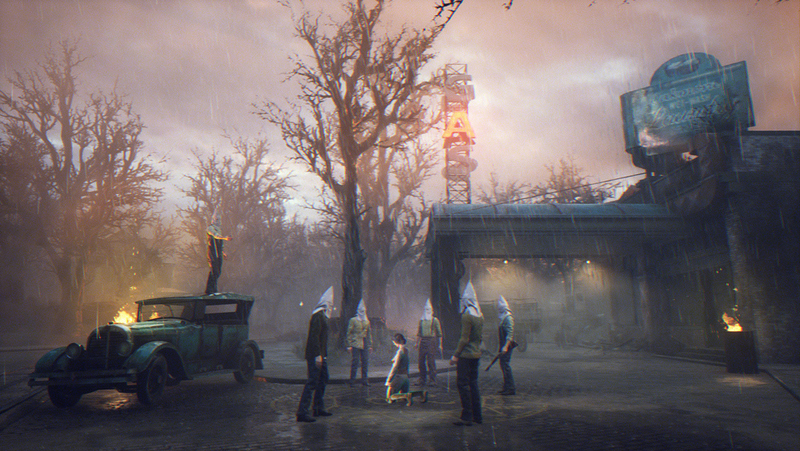 Those will obviously - or hopefully - be fixed by the time the game launches, leaving the only other bit of worry I have about the title centered on one of the themes of the game: racism (something I can only imagine was also inspired by H.P. Lovecraft). Upon starting it up, a disclaimer let me know The Sinking City isn't going to shy away from controversial subject matter. The game takes place in a time when racism was rampant in America, though writing that sentence right now makes me realize I should be more specific and say it takes place in the past. Initially, I thought the game would only tackle more fantastical racist themes with two hybrid species present in the narrative: the Planet-of-the-Ape-like Throgmorton's and fish-faced Insmouthers. However, as you can clearly see from the picture above, actual racism against black people plays a role too. Choosing the right binary options broker can be very time-consuming. 7binaryoptions.com makes it much faster and easier. Grimshade has been released on GOG to a 10% launch discount. Grimshade tells the story of the company of heroes, by a twist of fate involved in the cycle of events unfolding in the world of Ree'fah. Numerous dreadful monsters infested the forest around the city of Brann and high walls could no longer protect residents from the attacks. The menacing army of the neighbouring kingdom suddenly landed on the outskirts of the city, wreaking havoc. There is no hope for salvation - the strength of the defenders is running low, but the King and his loyal Champions had vanished. Series of sudden events and odd coincidences force people to act. Get acquainted with each of the heroes and unite them - entirely different, sometimes bizarre and frightening, with their motives, but one purpose for all - to find out the real causes of what happened to them. Lead the group of the adventurers on a journey and explore a varied and intricate world, meet new characters and reveal plot-related secrets. Remember, beauty is deceptive - danger lurks everywhere. Test your skills in challenging turn-based battles, adjusting your combat tactics and optimal team combinations for each foe you met on the way. Complex tactical turn-based battles: a variety of elaborate enemies won't let you complete the whole game using a single tactic or invincible team build. Choose wisely the squad you take in a fight - proper positioning and awareness are essential to your success struggling against powerful foes. A Kickstarter update for Thea 2: The Shattering announces a May 13th release date. Thea 2: The Shattering launch date announced! So the cat is out of the bag, we hope to release our second baby out in full on May 13th 2019! 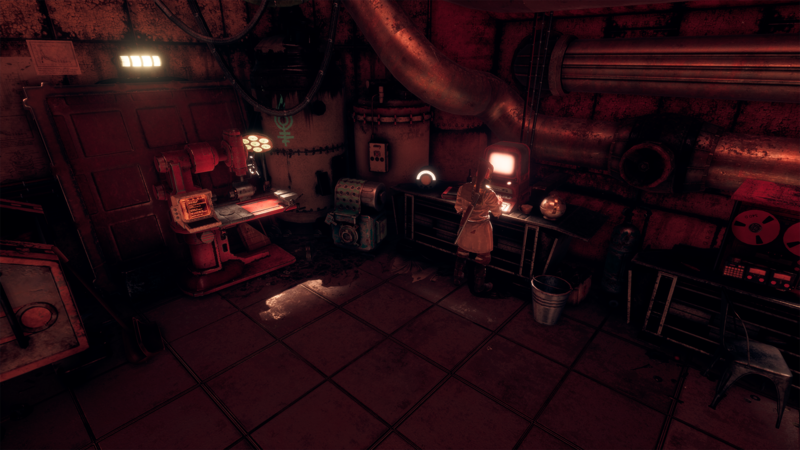 We still have several weeks of hard work and heavy polish to make the game what we want it to be before release, but we are confident Thea 2 is nearly ready to see the wider world. The minimap is live, so no more guessing where the other biomes are hiding. We've made an array of significant changes, updates and additions during ea, and we hope you will enjoy the final product. Those are but a few of the major changes, but we've also been constantly improving and fixing things, in accordance to our wonderfully active community. Thanks you for submitting this news! Twinfinite and GameReactor have previewed Divinity: Fallen Heroes. Is the X-COM-style gameplay loop going to hold up over 60 missions? Or perhaps a better question is whether it will compare favorably to the Divinity games fans are used to? That probably depends on how involved the story, characters, and decision-making is in the finished game. I wouldn't bet against Larian Studios getting the balance right, as I'm certain they know just how important storytelling and role-playing agency is to the Divinity franchise. Still, this has been designed as a combat-heavy Divinity experience targeted at those who relish strategic turn-based battles, and in that department, it looks like a real winner. Quite how deep the story goes remains to be seen, and we'll need to see careful use of the characters if they're going to remain as relevant in Fallen Heroes as they were in Original Sin II. 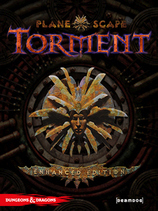 That said, all of the characters we know and love are still very much present so prepare to fight alongside Fane, The Red Prince, Lohse, Sebille, Ifan Ben-Mezd, and Beast in this tactical twist on the series. There's huge potential for this one given its rock-solid origins, although there's a way to go if it's going to live up to the standards set by Original Sin II. VG24/7 talked to Chris Avellone about Obsidian's Knights of the Old Republic 3. "The third game involved you, as a player character, following where Revan went and then taking the battle to the really ancient Sith lords who are far more terrifying than the Darths that show up. These guys would just be monsters. These would have a level of power that was considerable, but at the same time you'd be able to dig more into their psychologies, and their personalities, their history, and even how they dealt with the player, how they talk with the player, the different powers they cultivated and developed, and for some of them like - they're the ancients, so they're not just ruling a solar system, [but] swathes of the galaxy. SideQuesting previewed Star Renegades and found it more than the sum of its parts. Star Renegades, at its most basic explanation, is a turn-based game in which we explore an overworld map to halt the advancement of an enemy force. But this is really just the top layer of the onion. 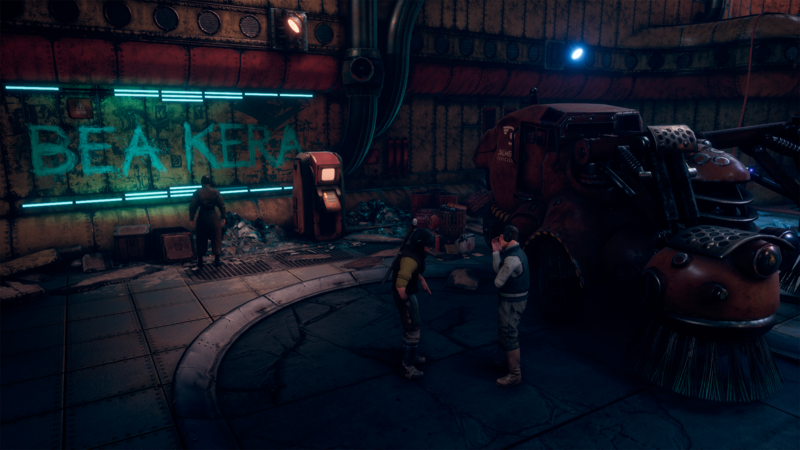 Underneath, it draws inspiration from a lot of games and genres, and pushes us to approach it much differently than we would a typical RPG experience. As we travel across the overworld from point to point with our squad, we can come across battles or mini-missions, alternate paths or bosses. How we pass these obstacles affects our play experience down the line, as our actions have very quick consequences. If we go one way on the map, for instance, we get caught up in a battle that may be slightly overpowered but gets us along further. If we opt to take a side path, we have to shut down a giant cannon that blocks our way, affecting our available actions on the map. This continues in a loop that could last for as little as 2 hours or as long as... well, as long as it takes to get to the other side. We can even form relationships along the way, building up our camaraderie with our squadron and even having progeny of our own that will join our battles in later loops. And while this 2-hour loop might seem fast, just 15 minutes in a demo had me advance far on the map, and feels like it packs a lot into a small space. It's much more flushed out than I could have imagined. DSOGaming reports on a GameInformer video which shows 15 minutes of new gameplay footage from The Sinking City. GameInformer has shared a video, showing 15 minutes of new gameplay footage from Frogwares' upcoming Loftcraftian game, The Sinking City. Naturally, we strongly suggest avoiding this video in case you want to experience this game for yourselves as it most likely contains spoilers about certain things. Twinfinite shares their list of the top 20 JRPGs on Steam. There are a handful of Tales games available on Steam, but if you haven't played the series before, Tales of Vesperia is the best place to start. Vesperia tells the story of Yuri Lowell, an ex-knight who, in a twist of fate, ends up helping a princess escape the castle he's imprisoned in. Like most Tales games, Vesperia features a phenomenal cast of characters who all build up interesting relationships with one another. Much like Dragon Quest XI, each party member in Vesperia has their own story arc and moment to shine. Vesperia's fast-paced action combat is also a nice break from turn-based RPGs, and you can directly control any of the game's nine party members, allowing for a ton of variation. The good news is that if you like Vesperia you can jump right into Tales of Symphonia, Zestiria, and Berseria, all of which are on Steam.Thanks Farflame! Check our recent news archives or the entire archives listing.